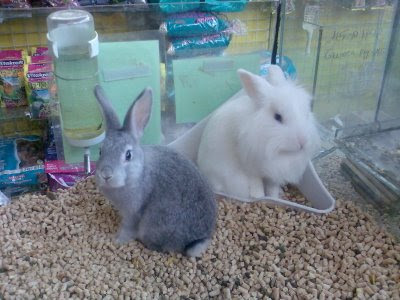 Sometimes when I'm feeling low, I stop by the pet store on Emek Refaim Street to . . . However. 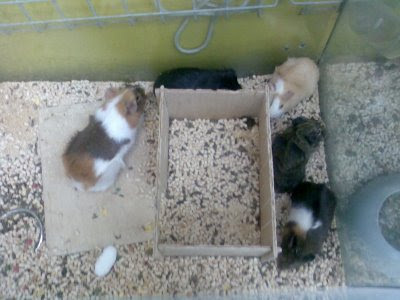 You see that calico guinea pig on the left? And how the others are cowering along the edges of their cage? That's because the calico guy was TERRORIZING the other guinea pigs. 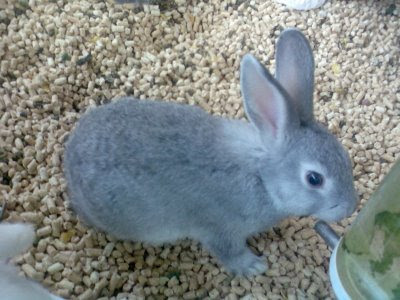 Just when they'd all find a nice place to relax and chew on a snack, he'd go RUNNING all over them, scattering them to the ends of the ... cage... and then wait for them to relax again before having another nervous fit and chasing them again. I have to admit that, being somewhat evil, I admired his personality. It's hard to see, but the throng of people extends down the street, past the back of the bus at the top of the photo. The irony is that the security system is meant to prevent anyone from blowing up the bus station, or spraying passengers with bullets . . . but any terrorist with a brain can easily figure out that one could kill 100 Jews at a time by detonating himself, or opening fire, inside the crowd of people waiting to get through the security. That's all for this time. Have a good week. PS If anyone gets information about the time and place of the funeral for Rabbi and Mrs. Holtzberg, please share it here. I want to attend. About a week and a half ago, I made plans to spend this past Shabbat at the home of my friend S., who lives in Shiloh. Shiloh is fairly isolated, and the buses from Jerusalem leave only about once an hour. I had been hoping to make the 1 pm bus, but there was so much cleanup to do after our Thanksgiving meal, that in the end I rushed through packing, put on the first nice outfit I could find (which was not really weather-appropriate, but I figured I'd be spending all of Shabbat in S.'s warm house) and left the my apartment at 1 pm, more than early enough -- I thought -- to make the 2 pm bus (the last one from Jerusalem to Shiloh on this cloudy and chilly Friday afternoon). I'd forgotten that the traffic on Yaffo street these days is horrendous due to the construction of a light rail, and traffic heading toward the Central Bus Station was at less than a crawl. I got out and walked most of the way up Yaffo, getting to the CBS at 2:05 -- chilled to the bone. 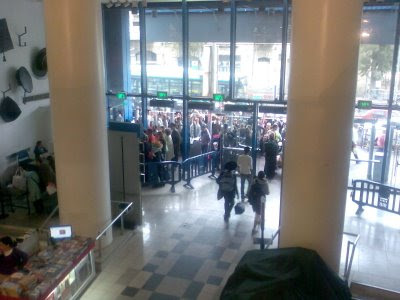 Did I mention that one of the two metal detectors at the Central Bus Station was out of service, so getting through security was a nightmare? Meanwhile, I'd called S. from my cell phone, and we worked out that instead of the bus to Shiloh, I'd take the bus to Kochav Yaakov, and she'd pick me up from there. S. picked me up about 40 minutes before Shabbat, and we drove faster than I'm used to, through the rain, to her house, getting there just in time for me to take a hot shower before candle-lighting. For the next few hours, all was well. I was warm and fed, and S. has really cool chairs in her living room that are exceptionally comfortable. At about 11 pm I slid into a deep sleep in my bed. 2:40 am: S. was yelling "Sarah! Sarah! Can you get up?!?" I thought maybe the house was on fire. The house was fine, but S. was not. On her way back to her bed from a bathroom trip, she'd fallen and hit her face on the corner of her nightstand. She had a deep cut just next to her eye, and there was blood everywhere. I convinced her to call for an ambulance, and we took the one-hour trip to Jerusalem in the back of the Shiloh emergency vehicle, in the company of two local medics -- a woman with a white kerchief covering her hair driving the ambulance, and a (very cute, I must say) yeshiva student in the back taking care of S. They'd taken one look at her eye and said in unison "Hadassah Ein Karem." So off we went. At Ein Karem, we had to walk back and forth between two buildings -- in the cold -- before finally settling down in the Opthamalogy unit. The Opthamologist was upset at first that neither the medics nor the ER staff had cleaned the wound, but then he looked at it and said "Nehedar! (Awesome!) No wonder no one else wanted to touch this." S. got several stitches next to her eye, and two in her eye. Have I ever mentioned that I'm extremely squeamish, especially about things having to do with eyes, and sticking things in one's eye? Ooooooooogh. Also, may I remind you that just weeks ago, I went to spend Shabbat with friends, and in the middle of the night the husband got sick, and they went to the hospital and I spent Shabbat in their home with their two kids? Do you remember that a few weeks ago I spent Shabbat in Hadassah Har Tzofim with Chava, who had just been diagnosed with diabetes? And that shortly after that, I went with my roommate to the Ein Karem ER because the old fracture in her spine had become excrutiatingly painful? What the heck is goin' on with me??? Anyhow, by about 9 am, S. was released by the hospital, but we couldn't go anywhere because it was Shabbat. We found the prayer service in the hospital, and the Shabbat meals, and a room set up with a few cots for Shomer Shabbat visitors. All in all, if you are going to be stuck in a hospital for Shabbat, it wasn't so bad. But ... what the heck? S. can see, but her eye looked really bad. And later, we returned to the Opthamology unit to get some more cream put on it, and --like I said -- I'm really squeamish about eyes, and there I was, surrounded by patients with eye injuries, and finally I said to S -- who was the patient -- "I am reaching my limit, and I need to get air or I will faint." I was sitting there with my head in my lap, taking deep breaths, and S -- the patient -- went to get me a glass of water. After Shabbat, my friend Yael got an SMS message from me that just said "Guess where I am right now?" Yael, bless her, happened to be on her way out to visit a cousin who was sick at . . . Hadassah Ein Karem. Yael knew right away I must be in a hospital, the question was just which one. In the end I waited for Yael to finish her visit, and got a ride home with her. Sunday: Attended a "Resume Workshop" sponsored by the OU here in Jerusalem. As instructed I brought my CV, both on paper and on a memory card. I was hoping that we could translate it from English to Hebrew, so that I'll have a Hebrew version to give to potential Israeli clients. But you only got about 10 minutes with your interview advisor. I met with someone named Ron Machol. He was quite helpful and gave me tips for how to rearrange the information on my English resume for an Israeli audience, and things that I could take out because Israelis won't care. I also met someone who has been wanting to talk to me about co-writing a screenplay. I've never written a screenplay. I haven't written fiction since I was an undergrad. But ... it could be fun? Monday: There was an event for deferred Barnard students, run by yours truly. It was a great success. Out of the 52 young women in Israel for the year who are slated to go to Barnard in the fall, 43 attended the event, along with 7 alumnae. There was about 45 minutes of mingling and bagel-eating, then about an hour of ice-breakers and little group activities to force everyone to meet new people. That part was run by RivkA, and it was lots of fun. Then each of the alumnae introduced herself and spoke about what she's been doing since graduating from Barnard, and then we had cake. The students loved the chance to meet their future classmates, and overall there was a good feeling. Glad I did it. Tuesday: OU Job Fair. I went to try to drum up new freelance work. I have two observations about this event. First, it was huge, with over 1,200 job-seekers and dozens of employers. I was very impressed with how smoothly it was coordinated. They even provided breath mints at every table (I'm big into breath mints because I'm always paranoid about possibly needing one). Kudos to the OU for all the effort they clearly put into this. Second, I realize intellectually that 1,200 unemployed people is not a lot, and that statistically it's not really a big deal. But in reality, when you see 1,200 people all together and realize that ALL of them are looking for work, it's quite depressing. When I arrived, I felt so confident. I'm talented! I'm professional! I've got a cool-looking folder! But by the time I left, I felt like a cog in a wheel. It was a very tiring experience... However! I may have gotten a second teaching job out of it for the spring. Not the type of work I was looking for, but what with the economy so bad and magazines and newspapers shutting down (one of my regular clients recently suspended publication), I figure that a temporary teaching job may help tide me over, in case things don't get better so quickly. Wednesday: Met with Noa L, a lovely young woman who is going to run the next UYO course in Israel. I'm sooooo happy that someone else is picking up the baton, and that another course will happen without my having to do all the work to make it so! Noa is a smart cookie and very enthusiastic, whereas I am burned out, so I'm really happy that she is taking this on. I met with her for two hours, giving her suggestions, so that hopefully she won't repeat my mistakes. The next course will be May 6-9, and I will be there to help out! Thursday: Hosted Thanksgiving dinner with my roommate. Made a 14-pound turkey with stuffing, and a great zucchini soup. Liza made mashed potatoes and 2 pies. Brought by guests: cranberry sauce, sweet potatos, green beans. There were 10 of us altogether at the table (7 American expatriates, 2 Brits, and one Israeli who used to live in America) and I think it was a successful meal. Good news: We were so organized about cooking and cleaning that I got to take a 2-hour nap this afternoon. Bad news: I was so tired before the meal even started, that I needed a 2-hour nap. It is now 11:30, I'm full of carbs, the leftover turkey is in the freezer, the dishes are being left for tomorrow, this blog post is done, and I'm going to bed! I'm planning an event for next week -- it's for deferred Barnard students in Israel for the year -- and instead of trying to do absolutely everything by myself to prepare, I went onto the Barnard Club in Israel list serve and asked if anyone could help me out with the shopping for food and paper goods (that's the only part of the process that is hard for me, since I have no car). And another alumna in the neighborhood volunteered, so now I have a ride, and company, and less stress. Asking for help instead of trying to do everything oneself is a good thing. And hard to learn! After maybe an hour of practice . . . I've decided I'd rather go slower and be accurate than the other way around. I just want to go on record saying that in English, I was last tested as typing 75 WPM, with 95% accuracy. 1- My newest project: Learning to touch-type in Hebrew. 2- My friend's son is going through the process of trying out for an elite army unit. He went through a round of exercises and made the first cut, which already is not bad considering that he just moved to Israel 5 years ago. Regarding the second, more grueling "audition," go here, scroll down to October 26, and then read posts going upward. Sorry, I tried linking to individual posts but it didn't work for some reason. 3- Funny series on YouTube, satirizing the gaming world. Episode 1 here. 4- Went to Arad today. More about it in the future Jewish Week article on the experience. For now, all me can say is, me like Kfar Hanokdim. I got an email a few days ago from Lubavitch.com, asking if I'd be willing to write for them. I'm not chassidish, as you know, and I have some misgivings about those Chabad-niks who believe the Rebbe was the mashiach, but I also am familiar with all the good works Chabad does all over the world. They do stuff no one else does. Upon some reflection, I decided to go for it. So here's my very latest piece -- I wrote it tonight and it went up shortly thereafter. It wasn't a big deal to research or write, but I know some of you (like, my relatives) like to keep up with my work and shep nachas, so since a link is available I'm providing it. Oh, lookie. Two more of my stories are online now, for the Jewish Week's Catered Events supplement. You can see them here and here. 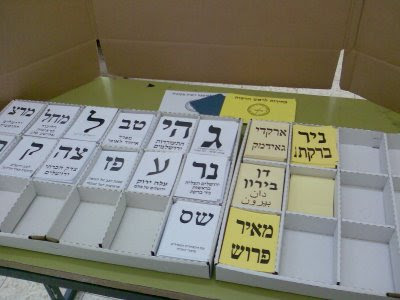 Inside the (makeshift, but private) voting booth: The candidate choices, my blue Israeli ID card to prove I was at the correct polling station, and the envelopes I was given to vote with. 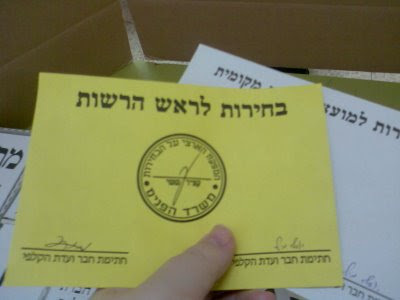 Inside the yellow envelope, you put one of the yellow slips of paper, indicating your choice of mayor. Into the white envelope you put one of the white pieces of paper, indicating your choice of party/slate for city council. You put the envelopes into a box on your way out, and you are done. No lines, no fuss. The whole thing was very orderly and took 5 minutes.
. . . which have gone through my mind lately. If, according to the Arab bloggers quoted here, Biden is a confirmed Zionist, and now Obama has appointed Rahm Emanuel to be his Chief of Staff, am I still supposed to believe that Obama will unquestionably be bad for Israel? May I posit that the "bad for Israel" argument is really about whether Israel is a) best off left to do whatever it wants, without interference from Americans who don't really understand what is going on, vs. b) encouraging Israel to move in a different direction because Israel does not always look out for its own best interests, and can't see the forest for the trees? Does anyone really know what is "best for Israel"? Do any Israelis know what is "best for Israel"? When dealing with a man who is Italian or French, how is it possible to tell if he is a) flirting with you, b) gay, c) simply being Italian/French? Inquiring female American-Israeli minds want to know. Why does IDC-Herzeliya -- which is quite a good school-- think that this advertisement, suggesting that oily Middle-Eastern car salesmen-in-training are representing them, will get people to apply? Am I the only one who noticed the references to The Merchant of Venice and to Judas in the comments to this article? How disturbing is that? Anti-semites are creepy, no matter what party they belong to. 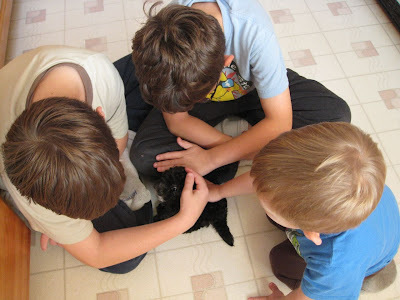 What should I do on the blog to acknowledge that this week is parshat Chayyei Sarah? Does the question itself fulfill the requirement? In Parshat Lech Lecha, God commands that descendents of Abraham should be circumcised. The Sefer Hachinuch, quoting the Rambam, says that one of the reasons for this commandment is that God "wished to affix . . . a permanent sign in their bodies to differentiate them from the other nations . . . just as they are differentiated in their spiritual form . . . this physical differentiation was set in the [male organ] as it is the causal source of the existence of the human species . . . "
Given that the commandment of circumcision is a very basic one -- the second in the Torah -- and that it is assumed to be for the purpose of differentiating the Jews, perfecting the body, etc, why did God -- for it is God, not the rabbis, who spell this out -- choose for the mitzva to be performed on a body part that only men have? Why not command that, say, one must cut the pinky finger such that there will be a scar? Or that one must remove an earlobe or something? Why set down such a fundamental mitzvah -- one that differentiates "the people" and symbolizes our very covenant with God -- in a way that only half the people can participate? I'm certainly not advocating the practice which has come to be known as "female circumcision" (which is NOT circumcision). Just saying: if the mitzvah involves removing a piece of the body that is pretty much superfluous, why not pick another body part so that the women, too, are marked as different from those of other nations? Why can't dishes magically wash themselves? and floors? and bathrooms? Why can't my clothes magically fold themselves and put themselves away? Have any of you tried this game? Is it good? Is it worth the money to register for it? My sister and her family got a dog! 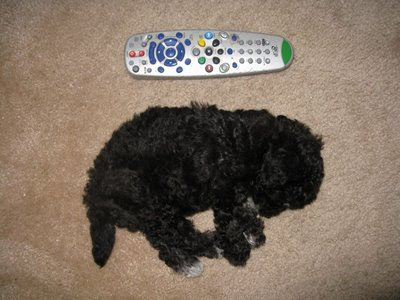 It is a cockapoo puppy, which apparently has some other breed mixed in because, according to the vet, she is too small for a pure cockapoo. She is about 9 weeks old now and weights 1.5 pounds. Her name is Mishmish (which means "Apricot" in Hebrew). She likes to chase my 2-year-old nephew around the couch (he loves it). Unfortunately I won't get to meet Mishmish until I visit them in America (probably next summer). Mishmish napping after a busy day. Mishmish soaking up the love from the 3 smallest humans in the house. 6:00 am: FOX has called the election for Obama! If FOX was willing to call it for Obama at this point, well, I feel it's safe for me to go to sleep now. Congratulations to all Obama supporters, especially the campaign volunteers. Obama ran a very good campaign. Applause for Senator McCain, who is a good man and a respectable man. Congratulations to everyone who voted for being part of the democratic process. Kudos to all Americans for supporting a peaceful transfer of power - even if it's to someone you do not support. Congratulations to black Americans. I'm really happy for you! This is so cool! Condolences to staunchly conservative blogger Robert Avrech. I look forward to reading complaints about the government on your blog for the next four years (sort of . . . I hope you write a lot more about movies, and about Ariel). 5:51 am: Well, given how many votes have gone to Obama, and how many seats are going to the Dems in both the Senate and the House, I think one thing is clear (or as clear as it can be when I've been up all night): American have just sent a very loud message to George W. Bush about what they think of him. Obviously there is more going on than just that, but I'm too tired to think straight about it. 5:40 am: FOX just called Virginia for Obama. One of the announcers said "Game Over." I hear people cheering in the background. Sleep or awake? Sleep or awake? 5:34 am: Obama is sweeping the swing states. Part of me wants to go to sleep, and part of me is really curious about which way Florida will go. Also, there are referendums I'm watching . . . or would be, if results were in and if I could find them . . . three states are voting about restricting abortions (South Dakota, Colorado, California); four states are voting about various issues relating to gay marriage (Florida, Arkansas, Arizona, California); and two states (Nebraska and Colorado) are voting on affirmative action. Those are exciting issues! I want to know what happens! I'm streaming FOX news while also checking NYTimes.com and CNN.com. On FOX they are talking about Palin: What she'll do next, and how mismanaged she was by the McCain campaign. They are saying that they should have let her talk more and make her case, rather than let Tina Fey make a case for her. (or against her, as the case may be). Interesting scenario they are bringing up: Stevens is booted out of the Senate, and Palin, back to being governor of Alaska, appoints herself to replace him. Then Palin and Hillary Clinton will have to see each other every day in the Senate. Wierd. 5:00 am: Even the cautious NY Times is calling Ohio for Obama. This is starting to get boring. Oh, for the days in 2000 when it was neck-and-neck all night! I do note that the popular vote is evenly split between BO and JM. America is still a divided country, even if it seems that Obama is winning easily. The electoral system is so ridiculous (though I acknowledge it has its benefits). Too tired to think about that right now. My bed calls to me . . .
4:52 am: FOX and CNN are calling Ohio for Obama. If they're right, as far as I'm concerned this is all over and I may as well go to sleep. You might be wondering who I want to win . . . well, maybe I'll tell you, and maybe I won't . . . but for now let's put it this way: If Obama wins, I'll think it's really neat that the US has gotten to the point, socially, where a black man can become President. And if McCain wins, I'll think it's neat that we have a female Vice President (even though I can't stand the woman and I cringe every time I watch her talk). Regarding their policies and fitness to lead, maybe I'll write about that some other time. Or maybe not. I've been posting updates at the bottom of my last post, but am thinking it would be better to create a new space for the live election blogging, and post new stuff up top. I cannot wait for tonight. I will be up, either at my desk with my internet connection on, or at the local "Barack, Arack, and Boreka" election party (so named by the Canadian-Israeli organizer because "Barack" rhymes with "Arack" - it's open to McCain supporters equally) at the PresenTense offices. I will have my lists of states, my maps, my pen and my calculator! Whoo hoo! Whoo hoo! All psyched to stay up until at least 4 am Israel time! Go democracy! Whoo hoo! 1:50 am: The polls are closing in some states, and I'm still up. Chose to stay at home where I can poke around doing chores in between checking the news sites. On my desk I've got a list of all states, who they voted for in 2004 and whether it was close, which states are considered "swing" this year, and how many electoral votes they each get. Am greatly enjoying the interactive features at NYTimes.com. Am ready to keep an eye on Senate and House seats, and results of referendums. Am psyched! 4:15 am: Well, finally we're seeing some movement. If the votes in early-reporting states go the way the projections say, Obama currently has 62 electoral votes to McCain's 8. In more definitive news, the Dems have won 51 seats -- a majority -- in the Senate. In between keeping an eye on the results, I'm watching Anne of Green Gables: The Continuing Story on YouTube, segment by segment. It is a terrible film. It has nothing to do with the books, and it's just all around bad. It moves slowly, the plot is going nowhere. It's awful. The only reason I can stomache it is that I'm pretending that it has nothing to do with the series by L.M. Montgomery, and just happens to be about people named Anne and Gilbert. That, and because once I start to watch a movie, it would have to be slighty more terrible than this for me to stop in the middle. But I'm tempted. 4:35 am: A distant muezzin is sounding; time for morning prayers! I find it very interesting, which news outlets are calling projected winners in various states. One would think that after what happened in 2000, they'd be more cautious. Some outlets have been projecting winners, even in swing states, after only 2% or 5% of precincts have reported in. The differences are wide: At this very moment, FOX, ABC, and NBC all say that Obama will pocket 200 electoral votes vs. McCain's 85 or 90. Meanwhile, the New York Times is the most cautious, attributing 87 votes to Obama and 8 to McCain. I'm sure they've all got there actuarial science behind them. But Sarah says: It ain't over 'til it's over. Tonight, the US goes to Daylight Savings Time. Therefore, the time difference between Israel and the East Coast will once again be 7 hours, and between Israel and the West Coast will be 10 hours.